Did you know the R.C.M.P. have a license to kill? That’s right, just like James Bond. James Bond gets away with loads of crap, so do the police. Why do they wear that cool gun, taser, baton, mace and just-in-case-they-actually-run-into-a-real-criminal, a bullet proof vest? Are there many “real” criminals in Canada? I know there are some …but how many really? Now, I’m NOT mocking the dangerous aspects of policing. In a very SMALL percentage of events they do face risk, in certain areas of a city (usually….but you never know). Canada is SO safe for police compared to so many places in the world. On a percentage basis, in most of Canada, I bet the risk factor is very, very low. Sound reasonable? I value and respect ANYONE who does their job honourably and treats people with respect, especially police, but I really wonder about a policing organization that allows, therefore encourages criminal behaviour by their own officers. It makes it tough on the good officers and hard on honest citizens. Have we got more than a few instances of police going Rambo on unarmed, peaceful citizens? Yep. Probably more instances of that than of police getting shot at or beaten. Are you more afraid of getting hurt by police… or a criminal…. or one of those mysterious-everywhere-but-nowhere terrorists? Sometimes folks don’t fully “cooperate” (comply with unlawful demands) by providing ID (it’s not required in most instances) or giving their name and date of birth (again it’s not required in most instances), and I’m not talking physical resistance here. For any lack of cooperation you may get tasered, abused, maced or even shot (though rare). They call it “gaining compliance”. Again, this is not with ALL police, but enough that it is a concern and you don’t know the good cops from the bad cops! Did you know that “not cooperating” is not the same as “resisting” and you even have the lawful right to resist an unlawful arrest….just be prepared to be hurt. Don’t ever brandish an office stapler at an RCMP otherwise maybe they will taser you to death too…then they will lie about the events, in spite of video evidence, cover each other’s butts, get let off by the RCMP internal review and not face criminal charges in the public. At least FINALLY they face perjury charges. 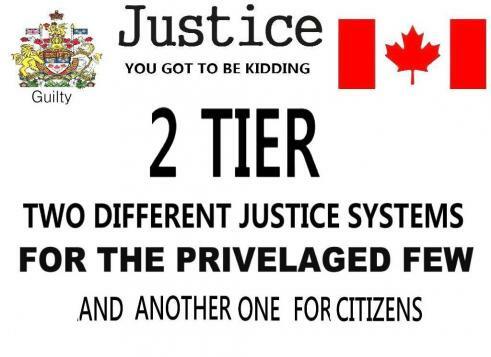 But it is like pushig a rope uphill to hold the actions of RCMP members to account (CBC perjury article – PDF of article Mounties face charges in Dziekanski case – British Columbia – CBC News). A recent decision on an old case just makes the RCMP get away with murder story get even more bizarre. Can you withdraw your consent and not be liable? It appears so. UPDATE: The sentencing is done and Monty gets a free pass, doesn’t even have to stand in front of a judge while his sentence is passed (you try that). Disgusting again. A few editorial articles and a lot of people agree. More than four years of PAID LEAVE (probably over $300,000 without working) and he gets a 1 month house arrest and “strict” curfew. Wow. 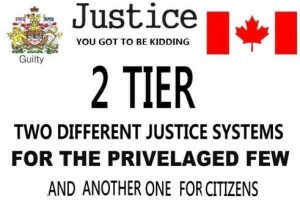 Kill someone with your car while under the influence of alcohol, leave the scene without providing assistance, drink more alcohol to mask the pre-collision drinking and get paid hundreds of thousands of dollars to hang out while the RCMP FAILS to discipline and shocker… so do the courts. Is that a fair summary or what? Oh yes, he was in charge of a gang of on duty RCMP ruffians who tasered a TOURIST to death at the airport, then lied about it and are facing perjury charges but nothing else. SAD! Conditions for Robinson’s sentence include a $1000 victim surcharge, keeping the peace during the 12-month period and following a strict curfew. Robinson was also ordered to write a letter of sympathy to the Hutchinson family. Rather, according to Dillon, other factors militating against incarceration included the fact that Robinson was a first-time offender, and as a police officer, he would have to be held in protective custody if he were sent to jail. So for Dillon, Robinson’s being a police officer worked against imposing a custodial sentence. And this is where the problem lies. For Robinson’s status as a cop should really amount to an aggravating factor – after all, the police are responsible for administering justice, yet justice is precisely what Robinson obstructed. It is therefore a very serious matter when a cop obstructs justice. And this alone should weigh very heavily in favour of incarceration. Furthermore, as Dillon detailed, there were other aggravating factors, including the fact that Robinson never showed any remorse, nor did he accept responsibility for his actions. That the British Columbia detachment of the Royal Canadian Mounted Police has serious problems has been obvious for years. The RCMP’s entire disciplinary process needs an overhaul — even the commissioner of the force agrees with that — and B.C. is in a particularly bad way. The province has long been treated as a dumping ground for the most troublesome of the force’s officers that the dysfunctional disciplinary process makes it impossible to get rid of. ….He will serve no time actually behind bars. It seems a light sentence given that an investigation into a fatal crash was deliberately compromised by a man sworn to uphold the law, not obstruct it. Robinson may yet see the inside of a jail cell, of course, pending the outcome of his upcoming trial for perjury relating to his allegedly false testimony during the Dziekanski hearings. But until then, it seems doubtful that the tarnished reputation of the B.C. Mounties will be helped much by a former officer dodging jail time in a circumstances where the average citizen could have reasonably expected to see jail time handed down, and would almost certainly have expected to receive some themselves in caught up in similar circumstances. What amazing insights have you just gained? Hmmm. What do you think? If we are in fact all equal under the law….makes perfect sense. KELOWNA – A judge in Kelowna has handed a former Mountie a suspended sentence and 18 months probation for assaulting a suspect. Geoff Mantler pleaded guilty to assault causing bodily harm for kicking Buddy Tavares in the face during an arrest in the Okanagan city two years ago. The arrest, which was caught on video by a bystander, showed Mantler kicking the man who was on his knees was about to lay on the ground. The sentence reflects the Crown request for Mantler’s punishment. Mantler’s lawyer was seeking a conditional discharge. The sentence means Mantler, who resigned from the force after the allegation, will have to report to a probation officer for the next 18 months. OTTAWA — A 41-year-old RCMP officer and his 34-year-old wife are accused of aggravated sexual assault, failing to provide the necessaries of life and forcible confinement after a child abuse investigation. According to police sources, the charges come after an 11-year-old was found wandering an Ottawa neighbourhood, starving and dehydrated. The child is believed to have been confined with shackles and handcuffs in a basement for several months. The child’s injuries are still being assessed, sources say. Ottawa police said the officer was arrested Tuesday after an investigation at his residence. He is charged with three counts of aggravated assault, three counts of assault with a weapon, and one count each of aggravated sexual assault, failing to provide the necessities of life and forcible confinement. The woman is charged with three counts of aggravated assault, two counts of assault with a weapon, and with failing to provide the necessaries of life and forcible confinement. As of Wednesday the man was suspended with pay from his service as an RCMP officer and an internal investigation was underway, said Cpl. Lucy Shorey of RCMP A Division. The officer has also not been on active duty since May of 2011. Shorey said she could not give details about why the man hasn’t been on active duty, how long the man has worked for the RCMP or in what capacity for several reasons, including wanting to protect the identity of the youth involved. Police say they won’t release the name of the accused to protect the identity of the victim. Both accused were expected to appear in court Thursday. Anyone with information can call the Ottawa police sexual assault/child abuse unit at 613-236-1222, extension 5944. An RCMP officer who was under investigation for having a relationship with a potential witness in the Surrey Six case has left the force following a charge of theft. Derek Brassington was charged with theft under $5,000 related to an off-duty incident in Burnaby on March 30. The charge was sworn Wednesday after approval by special prosecutor Christopher Considine following an investigation by the Burnaby RCMP. The former RCMP sergeant is due in Vancouver Provincial Court on May 7. RCMP brass announced Brassington’s departure from the force on Thursday. “This morning Mr. Brassington’s discharge documents were received and signed by the Commanding Officer. Mr. Brassington voluntarily submitted these documents,” RCMP Chief Supt. Brian Cantera said in a statement. “While we have been clear that the RCMP was seeking his involuntary dismissal, the opportunity to discharge him from the organization this morning was one which eliminated further delays, costs and uncertainty,” Cantera continued. Brassington has been charged with obstruction of justice and breach of trust in relation to his alleged conduct with a witness during the investigation of the Surrey Six murder case. A special prosecutor approved seven charges against him in June 2011. Brassington is due in B.C. Supreme Court on those charges this fall. Three other RCMP officers will face charges in connection with that investigation, ranging from breach of trust to compromising the safety of a witness: Sgt. David Attew, Cpl. Paul Johnston and Cpl. Danny Michaud. The officers were suspended in 2010 after an investigation. The October 2007 Surrey Six gangland hit in Surrey’s Balmoral Tower apartment building left four gang associates dead — Edward Narong, 22, Corey Lal, 21, Michael Lal, 26, and Ryan Bartolomeo, 19 — and claimed two innocent victims — Chris Mohan, 22, a building resident on his way to play basketball, and Ed Schellenberg, 55, a tradesman who was repairing the gas fireplace in the targeted suite at the time. Three men accused of the crime — Cody Haevischer, Matthew Johnston, Michael Le — will face trial on murder charges in B.C. Supreme Court in New Westminster this fall. Co-accused Jamie Bacon will have a separate trial in Vancouver, at a yet- to-be-determined date. A fifth man, Sophon Sek, is charged with manslaughter and is to make his next appearance in Surrey Provincial Court next January. Dennis Karbovanec pleaded guilty to three counts of second-degree murder and conspiracy to commit murder and was sentenced to life in prison. Lawyers for four Mounties charged in connection with the Surrey Six murder investigation are back on the case but the trial will be delayed, court heard Thursday. The lawyers for the accused withdrew from the case in September following difficulties getting legal funding from the RCMP. But during a brief appearance in B.C. Supreme Court Thursday, the lawyers advised Justice Arne Silverman that they had been retained to represent the accused. “Great news, good work,” said the judge. Michael Klein, a lawyer representing accused Sgt. David Attew, told the judge it was unlikely they would be able to accommodate the September trial date but asked to preserve the court time to deal with pre-trial motions. Special prosecutor Chris Considine told the judge that, realistically, he doubted the trial could go ahead in the fall, saying there was still some disclosure to be made to the defence. Outside court, the defence lawyers declined to comment on whether the RCMP had now provided legal funding. It was unclear when the new trial will be. The next court appearance is April 2. Attew faces six counts, including claiming false expenses, falsifying overtime claims and compromising the safety of a witness, identified only as Jane Doe. Sgt. Derek Brassington is charged with seven offences, including breach of trust, fraud, obstruction of justice and compromising the safety of a witness. Cpl. Paul Johnston and Cpl. Danny Michaud face four and three charges, respectively. I have a policy of not using LATIN phrases, being roman civil law in nature, and many phrases are debated as to what they really mean. I’ll stick to plain english, common usage definitions in my documents…avoiding all forms of legalese. If I’m outside their world why use their language is my thought. Re License, my understanding of license is “permission to do that which would be illegal to do with out said license” which means the granting of a privilege…not confirmation of a right. Big difference. Again I’d suggest another position on insurance. Limited liability is corporate in nature a common law man takes responsibility and not pass it off to another. Personally I never drive commercially, but you make a good point to force them to prove EVERY presumption they make. Thanks for your comments and keep questioning everything. How about some modifiers to that fear reason. Could sign V.C. then your name. Reasoning? Vi Coactus means under duress. IF I don’t sign this I will be unduly harassed by police. Then we get to have a bit of fun. How many people have taken the time to understand that a license (by its real definition) is the proof of a right held? Its root is from Latin and had to do with the King (Henry) asking people (namely the church and the upper class) by what right they exercised their freedoms – he was asking for proof. Tie that in with the proof of competency argument and there is only one other reason to sign into the MVA. Insurance. You aren’t signing up for your benefit, but because it is a requirement to be insured, and you feel a moral obligation to yourself and your common man to be insured. It isn’t to permit you to drive recklessly, but to protect everyone if you do wind up in a wreck. And then there are all of the other tacks we could come up with to question jurisdiction. Sure I drive commercially, and I allowed you to use that license to identify me, but do you have any proof that I was driving (operating commercially) at the time in question? I want ALL of the following as proof, otherwise you are operating on presumption and not on facts. If you resign before trial and you know how to communicate your understanding of what that means, so they know you know… (H4J-In Action course) then maybe there would not be a trial. You must remember they will push almost everyone to the point of trial hoping the individual doesn’t know what to do or folds under the pressure. Why would you WANT to join the MVA once you know what it is, if you are not engaged in a commercial activity? 3 reasons I can think of, one you want the perceived protections but not the penalties (hmmmmm, tsk, tsk), two you understand the game and want to play… three to avoid being harassed by uninformed police (fear). Any others? What if you resign before your trial? What if someone received a Violation Ticket ticket for, say, going 142 kph in a 60 kph zone, and they resigned from the MVA Act before setting a court date to dispute the ticket? How might that affect that person, if down the road (no pun intended), they wanted to rejoin the MVA?